With Towers Realty, you’re open for business. Our client-focused approach and respected portfolio set us apart from other commercial property management companies, and reflect a commitment to excellence in everything we do. Zoned as retail or office space for rent in the city’s North-East, this sought-after location offers franchise or small business owners up to 2,589 square feet of prime commercial real estate. Winnipeg’s Towers Realty delivers award-winning service, development and consulting solutions as one of the region’s most trusted residential and commercial property management companies. Prospective renters interested in our popular retail units for commercial lease are invited to discover the advantages of worry-free tenancy and the benefits of being in the right place at the right time. 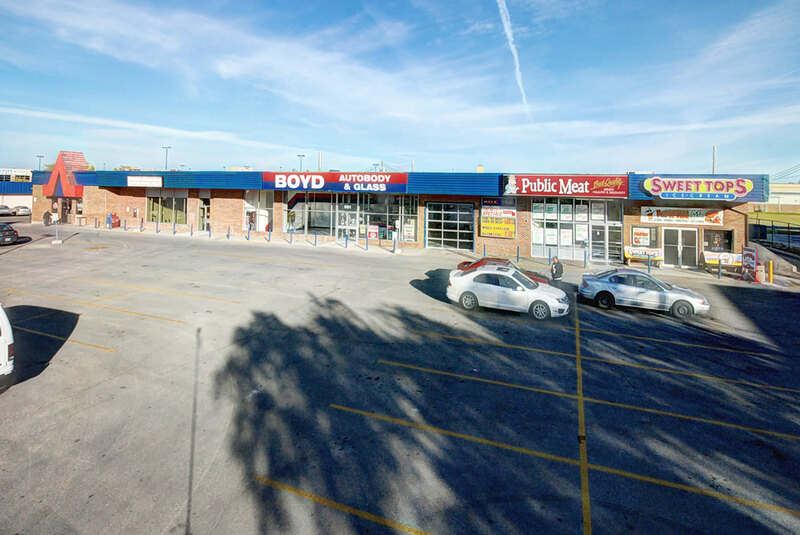 Just 10 minutes to downtown on Highway 42, and fully accessible by transit, Northdale Shopping Centre commercial properties for lease in Winnipeg serve a high volume of residents and visitors daily. Join popular restaurants, auto body services, grocery and pet supply stores, as well as enduring financial institutions already featured at this central strip mall location. Close to residential neighbourhoods, schools, parkland, hotels and all amenities, 955 Henderson Highway offers retail and office space for rent ideal for your growing business. The search for commercial office space for rent, streamlined. Towers Realty delivers a standard of service exceeding that of most commercial property management companies, eliminating the guesswork with preview tools, specifications, maps and rate information for all of our Winnipeg rentals. In 2013, Towers Realty received the PPMA’s Innovation Award for our user-friendly online application and payment system for residential property tenants. For details about spaces now available for commercial lease, call us at Towers Realty, or contact the Colliers International salesoffice for rent information regarding Listing I.D. # 5920. Nestled between the provincial capital’s growing residential areas of Rossmere-A and Kildonan Drive, on the banks of the Red River, a commercial space for rent on Winnipeg’s Highway 42 seamlessly connects people to great products and services. Invest in your professional future by contacting Towers Realty commercial property management; we put companies on the map. Companies need to be found in order to better serve their customers; at Towers Realty, we offer premium, high traffic locations for commercial lease that are both well-maintained and centrally located for ease of access. Recognized by the PPMA’s commercial property management companies and the Better Business Bureau for green innovation, as well as renovation and marketing excellence, Towers Realty offers business owners the advantage of our commitment to quality, transparency and service. At Towers Realty commercial real estate, Winnipeg, we believe that sustainability begins at home. That is why our energy efficient renovation projects at several of our residential properties continue to save nearly 500,000 kilowatt hours of electricity annually and reduce natural gas consumption by half a million cubic feet every year. Recognized among commercial property management companies for eco-conscious innovation by the Better Business Bureau, we are the proud recipient of the 2012 Environmentally Friendly Torch Award. At Towers Realty, our management of residential and commercial properties for lease in Winnipeg is guided by the principles of service, honesty, and a steadfast commitment to ethical business practices. When you rent commercial real estate in Winnipeg from us, you can be assured that as our client and tenant, you can expect to be treated with courtesy and respect. Accountability is important to us. Towers Realty is pleased to abide by the membership codes of ethics for residential and commercial property management companies of the Professional Property Managers Association (PPMA), and the Building Owners and Managers Association, Manitoba chapter. Few commercial property management companies can also provide you and yours with a great place to live. Explore diverse condominium and apartment options in addition to commercial properties for lease in Winnipeg and surrounding areas, ideal for students and young professionals, families and seniors. Great service is our priority: potential candidates can take advantage of convenient downloadable application forms, and our residents are offered pet friendly options, flexible payment choices and access to our 24/7 emergency maintenance hotline. New for 2015 and beyond, tenants at our residential properties may enjoy an exclusive benefits card, a unique feature not offered by other commercial property management companies, which entitles the owner to valuable savings at participating neighbourhood restaurants and services. Commercial space for rent in Winnipeg’s North-East positions your business just minutes from downtown and major tourist attractions such as the Royal Canadian Mint, the world-class Winnipeg Art Gallery, wild bison spotting at FortWhyte Alive, serenity now at the Thermea spa, and a unique interactive educational experience at one of the country’s newest and most highly anticipated landmarks, the Canadian Museum for Human Rights. In addition to providing citizens access to a great place to live and make a living, commercial property management companies also have the opportunity give back to our communities we help to build. Towers Realty is proud to support the important work of both the Diabetes Association and Habitat for Humanity Manitoba. To inquire about retail opportunities in your area, contact the Towers Realty Group by email or call 204-956-2739 today. Your partner in a sound investment, Towers Realty affords commercial properties for lease in Winnipeg that minimize risk and maximize your business potential.